Mom, the Intern: Settle this for me. Heeeey everyone! It's dancey-dance time! Anyway, I turned to her and said, "Plex doesn't have a mouth." But she insisted he does. She said it's the black "smile" on the silver part just below his eyes. I'm not convinced. I thought the silver part was his neck. Who has a mouth on their NECK? That's just weird. Plus, doesn't he talk out of that speaker on his chest? I called Dill into the room and posed the question. He said he agreed ... with Bubby. What?? 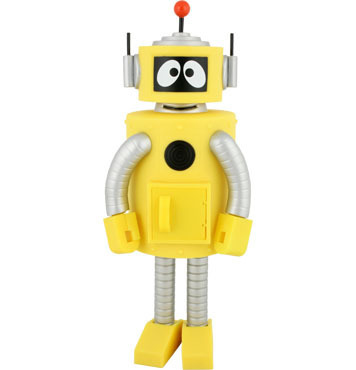 So, settle it for me: Does Plex the Robot have a mouth or not? Also, this Super Music Friends Show segment makes me happy. So it will probably make you happy, too. Therefore, watch it. Ummm...I'm not even going to tell you how many youtube clips I've watched while my kids were at school so I can make an educated guess. It looks like Plex is brushing his neck area with the "tooth brush", so I'm voting neck. Hahaha this did make me vurry hapaaay! And I gotta go with the bubs on this one, sorry my love. If you want, I'm friends with the creators of Yo Gabba Gabba's sister (she's in my ward) so I can send her a message to pass onto her brother to get the final answer. LOL! Mouth. Sorry, it's a weird mouth on a neck. Yet another reason NOT to watch that strange show. My kid is OBSESSED with that show! And I've actually grown to really like it - Mr & I actually will break out into gabba songs randomly.